We are always in search of the latest and greatest innovations to reduce, remove, implant, or enhance our aesthetic, especially when it comes to fighting the infamous battle of the bulge. A just recently released product seems to be the “next big thing” when it comes to that. For those of us who don’t have the necessary downtime needed for surgery or just simply don’t feel comfortable with it, there is now a product called Kybella® that literally melts away the submental fat underneath the chin. So many of us complain of the turkey neck or double chin, and now with a few injections, you can rid yourself of that fat in just a few treatments. The first FDA approved injectable substance to treat submental fat, Kybella® is designed to dissolve stubborn fat under the chin. 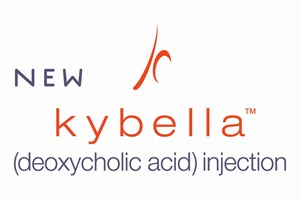 Kybella® is deoxycholic acid, a fat-absorbing substance found in our bodies naturally. When injected, it destroys fat cells under the chin, leaving the skin substantially tighter and the jaw more contoured. For most people, it would take 2 -4 treatments of Kybella® to remove the majority of submental fullness. Could Kybella® be the next “Botox”?